Our heroes on the half shell must battle one of their own in this exclusive sneak peek at BATMAN/TEENAGE MUTANT NINJA TURTLES II #5. For as much as we love them, the Teenage Mutant Ninja Turtles are pretty fearsome creatures. Giant, mutated reptiles wielding weapons who are also master martial artists? Let’s just say if most of us ran into one of them in a dark alley, our first instinct would be to run. Fortunately, they’re on our side…most of the time. But the whole good and evil thing gets kind of fuzzy when Bane’s infamous Venom gets involved. Determined to take down the wicked Foot Clan, Donatello has pumped himself up with Venom, making him stronger and more formidable than he’s ever been, but also unable to control himself. None of which bodes well for Batman and Leo when they try to intervene. Will the two heroes be able to subdue Donnie…without having to do anything they’ll later regret? 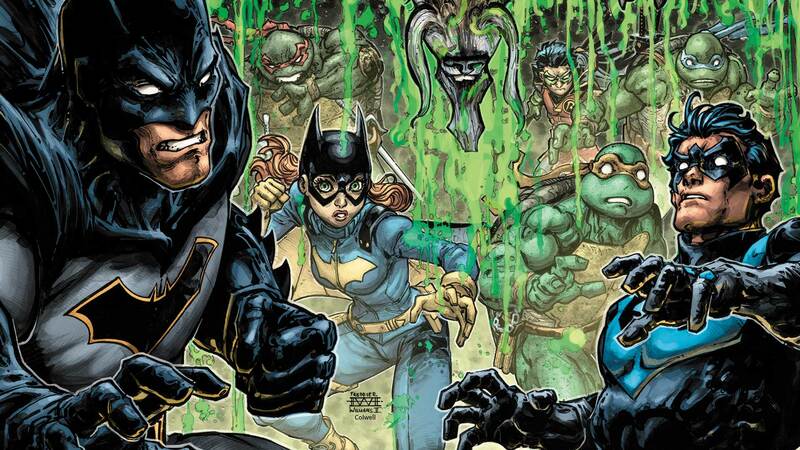 We’ll find out together later this week, but you can see how the whole thing gets started in this thrilling first look at BATMAN/TEENAGE MUTANT NINJA TURTLES II #5. BATMAN/TEENAGE MUTANT NINJA TURTLES II #5 by James Tynion IV, Ryan Ferrier, Freddie Williams II and Jeremy Colwell is in stores this Wednesday.